WinLicense is a powerful protection system designed for software developers who wish to protect their applications against advanced reverse-engineering and software cracking. 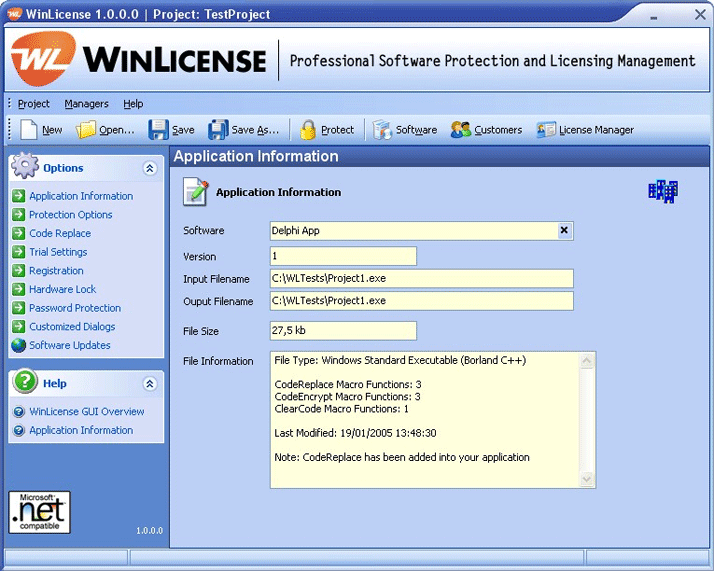 Developers do not need any source code changes or programming experience to protect their applications with WinLicense . WinLicense uses SecureEngine? protection technology, which is able to run its code at the highest priority level to implement. WinLicense is professional Software Protection & Licensing Manager. *Multilevel encryption to protect code and data in an application. *Advanced detection of cracking tools. *Execution of code the highest level of priority to implement never before seen protection techniques. *Scrambles executable code, data, and APIs in the application to avoid any possible reconstruction of the original application. *Protection against all disassemblers and debuggers. *SDK offers two-way communication with SecureEngine? and the protected application. *Advanced technology which prevents dumping from memory to disk. *Fully customizable protection options and dialogs. Qweas is providing links to WinLicense 1.960 as a courtesy, and makes no representations regarding WinLicense or any other applications or any information related thereto. Any questions, complaints or claims regarding this application WinLicense 1.960 must be directed to the appropriate software vendor. You may click the publisher link of WinLicense on the top of this page to get more details about the vendor.